Apparently, opossum are the only non-human North American mammals that have opposable thumbs, and those thumbs are on their hind feet. In the picture here, do any of the tracks appear to have thumbs? Looks like it, from the print along the bottom edge of the photograph, and from this photo, as well. 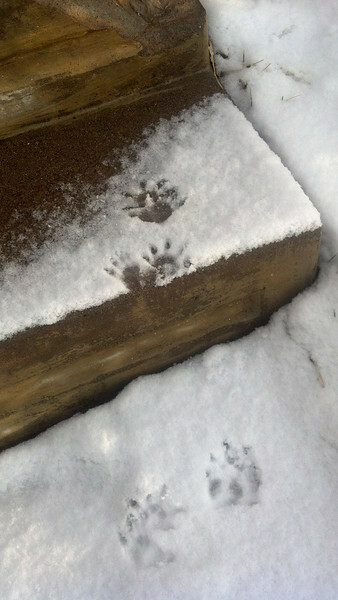 So, our OUS (Opossum of Unusual Size) returned to our back stoop for a visit, just after last week’s snowfall. Healthy, balanced spinal alignment in a standing posture relies on knees that are slightly bent. A trainer pointed out I tend to lock my knees out, when standing still. Not surprisingly, this explains why my low back gets sore, after standing for any length of time. I’m working on un-learning that habit, which forces the pelvis to tilt forward, which puts strain on the lumbar area. The miracle of the human spine is revealed once more to this yoga teacher and human body owner. Healthy, balanced spinal alignment when standing or seated also relies on the ears aligning above the shoulders, hips, (plus bent knees, and ankle bones, if standing). How to get there, if your ears (and chin, likely) jut forward, perhaps teased into that angle by hours at a computer screen? Simultaneously lift (as in, toward the sky) the chest/sternum area, while actively pulling down the lowest segment/part of your neck. It can also help to visualize a string (or ponytail) attached to the back of your head, being gently pulled directly upward. While I rarely stood still during my recent Birkebeiner nordic ski race, I did get the chance to work on the second item, quite a bit: all those hill climbs (check out the elevation profile, here) can tempt a skier to lean forward, frequently. Every so often (as often as the effort forced me to search for techniques to make things easier), I remembered to lift the back of my head and pull my chin back. Each time, it felt good, but the exercise also likely enabled me to last that whole 7.25 hours on the trail. A cue that is often used in yoga classes is “pull your shoulder blades into and down your back.” This always left me a little confused and also a little bit tired: it cued me to retract my shoulders, rather then to broaden and relax them. Perhaps this is because I’ve always thought just of the very tips of my shoulder blades, when considering my shoulder blades, rather than the whole scapula bone, for whatever reason. Maybe that part of my shoulders is what seems most like “blades” to me. Instruction in body movement, i.e. for yoga or for different fitness classes, relies on variety in teaching modalities for this reason: we all have unique experiences in our own bodies, and often we also have somewhat unique vocabulary for what’s going on when we move. Verbal cues often confuse more than help, but then, so can demonstrations: every body is different. I’m hoping that the combination that I use with my students is effective for them; I’m pleased that some of them have told me that they appreciate my efforts to keep learning from a variety of health, yoga, and fitness professionals. The yoga teaching adventure continues. Namaste.